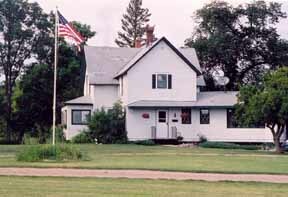 You will enjoy the flavor of this old country farm house, first built in the 1880's and added on to as the family grew. The last remodeling was done in the 1950's so you can feel the presence of those who have lived here before. All four buildings on our farm are heated and air conditioned. Contact manager Mary Lee Robinson for details. 701-845-1377 office or 701-840-0194 cell. SCHOOL HOUSE CABIN - Re-live the past in this historic one-room schoolhouse, This school turned cabin provides comfortable lodging for two or three guests, right in the midst of the furnishings and books of the original schoolroom. Hunters are welcome. All four buildings on our farm are heated and air conditioned. RV PARK - Beautiful park areas, picnic tables, grills, fire pit. Riverbend Farm has a small RV Park—but lots of room for self contained vehicles. Enjoy the park-like area with the Sheyenne River on three sides, trails for you to walk in the woods, look for deer and other wildlife, and enjoy the music of nature. Copyright © 2019 Sheyenne Riverbend Farm. All rights reserved.